Bucegi Mountains is the closest hiking option from Bucharest. The 2,500m height is suitable for short hiking trips in idyllic sceneries. If you want a short hiking escape from the city, we have created a hiking tour which pass from Peles Castle (Sinaia) to Bran Castle, crossing Omu Peak - the highest point of Bucegi Mountains. The tour can be organized during the touristic season (from May to November). The estimated effective trail time is 10-13 hours, according with the touristic routes. Group meeting in Sinaia and check-in. Visit of Peles Castle. In the evening: dinner and trip preparation. 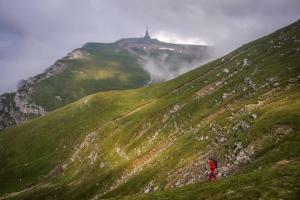 The proposed route: Sinaia – The Royal Sheepfold – Piatra Arsa – Babele – Omu Peak – Bran. Objective on the route: the Royal Sheepfold, Babele, the Sphinx, Omu Peak. If the group will not reach Babele at 13:00 or in case of bad weather, the group will accommodate overnight at Pestera Hotel, near Babele. The route will continue the second day toward Bran. Breakfast. Visit of Bran Castle.